- THE HIGHEST RATED, MOST TRUSTED and BEST: We love our customers and consistently deliver VIP level customer care to each and every one. Try our steamer riskfree for 60 days you'll love it well refund every penny no questions asked. 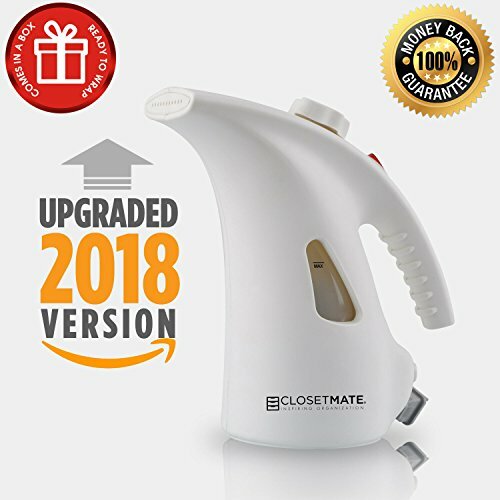 - SMALL BUT MIGHTY THE MOST POWERFUL: WIDERELEASE steam nozzle activates in 90 SECONDS or less to easily, quickly and naturally steam away large areas of wrinkles and refresh fabric FASTER than any other. - Our garment steamer is Your Best Choice and The One to Get if you want the FASTEST, SAFEST, most powerful compact and lightweight steamer on the market. It even REFRESHES CLOTHING and FABRIC fibers so everything you own LASTS LONGER. - SAFEST and EASIEST IDEAL FOR gently smoothing away the TOUGH WRINKLES in delicate fabrics, stiff drapery, thick bedding, expensive suits, tablecloths, and, of course, any iron safe garment RETRACTABLE CORD STRETCHES a full 7.5 feet, giving you AMPLE FLEXIBILITY to steam and sanitize everything in your home.